Every Al-Anon member is encouraged to actively use and study the Al-Anon/Alateen Service Manual. It gives a clear and concise picture of the Al-Anon fellowship, it's purpose and functions and how it helps us to resolve group problems and maintain unity. Members seeking answers to specific questions of special situations may well find guidance within these pages. 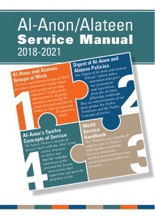 The 2018-2021 version of this Al-Anon/Alateen Service Manual is available online on the World Service Office website: https://al-anon.org/for-members/members-resources/manuals-and-guidelines/service-manual/. The online version of the Manual is updated between printings as changes are made to reflect new information and changing points of view. The hard copy of the Manual can be purchased at your local Area Office. For this latest edition of the Service Manual, the section "Al-Anon and Alateen Groups at Work" is also being printed as a separate booklet (P-24) as a tool for groups in the hopes of making this important group information available to more members worldwide. The South African service manual, the National Al-Anon Service Structure (NASS) is currently being updated and will be available here once complete.